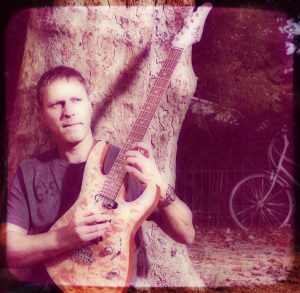 *Has been playing guitar professionally for over 30 years and has recorded and/or played with Scott Henderson, Frank Gambale, Scott Kinsey, Dan Gilbert, Carl Verheyen, Michael Angelo Batio, Marco Minnemann, Steve Hunt, Allan Holdsworth, Shawn Lane, Brett Garsed, Gary Husband, Jimmy Johnson, Derek Sherinian, Carl Verheyen, Kiko Loureiro, Greg Howe, Guthrie Govan a.o. *While in LA., recorded the fusion classic ‘Generator’ for Mark Varney’s legendary Legato Label at age 22. That cd also featured Scott Henderson, Frank Gambale, Carl Verheyen, Scott Kinsey. *Performed two years in a row (2010 and 2011) at the Ziua Chitarelor Festival in Bucharest with Andy Timmons, Greg Howe, Guthrie Govan, Brett Garsed, Mattias Eklundh. 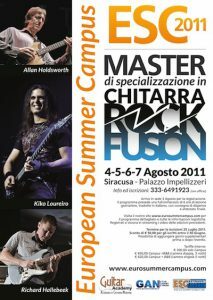 *Teached and performed live for 4 days with Allan Holdsworth and Kiko Loureiro at the ESC 2011 festival in Sicily, Italy. *4th price winner of the wordwide Yamaha Band Explosion contest at the Budokan Hall in Tokyo, Japan in 1989. *In 1993, out of 350 entries, Richard became the 2nd price winner of the Ibanez Guitar Award at the finale in Ahoy, Rotterdam. *In 2010, Richard headlined the ‘Meeting Of The Spirits’ festival in Leewarden, Holland together with Greg Howe and Carl Verheyen. *Richard has done two tours throughout Holland and Germany in 2011 and 2012 with Guthrie Govan and Jose de Castro as a ‘rock-blues-fusion G3’ project. 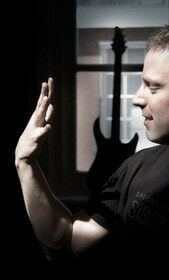 *Released three instructional DVD’s for TrueFire: ‘Scale Creativity’, ‘Chord Creativity’ and ‘Creative Lick Phrasing’. 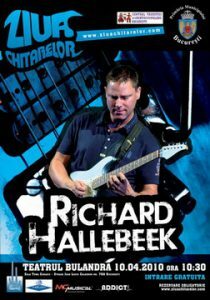 Born august 2, 1969 in Bilthoven, Netherlands, Richard Hallebeek started playing guitar at age 10 and took lessons from local teachers. He formed some local bands and started performing in various jazz and rock groups already at age 12. Completely emerging himself in music as a total guitar-nerd, influences early on were The Beatles, Pat Martino, Allan Holdsworth, Weather Report, Charlie Parker, Eddie Van Halen, Pat Metheny, the radio and every album he could get his hands on at the local library. Already at the age of 17 he was the youngest guitar player ever to be submitted to the Hilversum Conservatory, a conservatory best known for it’s strong jazz history drawing musician’s from all over Europe. Richard studied with jazz legend Wim Overgaauw and graduates with a master’s degree after a 6-year study of jazz, composition and improvisation. 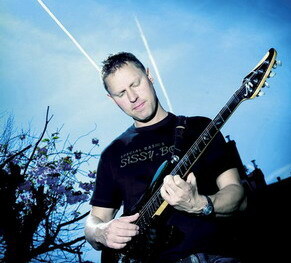 In 1993 Richard was chosen out of more then 350 entries to take part in the International Ibanez Guitar Award with 8 other players to fight for the title of ‘Best All Round Player’. The finale took place in Ahoy, Rotterdam and in the jury were a.o. Alex Skolnick (Testament) and Dutch session ace Lex Bolderdijk. 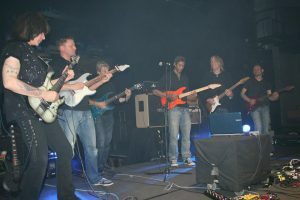 Performing the Jazz Standard ‘Road Song’, the Rock Classic ‘After Midnight’ in an ‘all instrumental’ version and playing an unaccompanied solo, Hallebeek became the second price winner and took home the 2nd price; a little 15 W amp and practised some more. Besides practising, in the ’90’s Richard plays steady gigs in a variety of different coverbands, he teaches and does countless sessions and studiowork for radio, movies, commercials, (Dutch PTT Phonecompany, Hooghoudt, Region Police, Fokker, etc.etc.) and TV. In 1994 he receives a scholarship for a foreign study from The Prins Bernhard Fonds. At the end of ’94 he leaves to Los Angeles for a one year study at the Musician’s Institute to study arranging, composition and improvisation. He studies guitar with Scott Henderson, Dan Gilbert, TJ Helmerich and Brett Garsed, a.o. He graduates after a year with an honors degree. It’s at his new home at Orchid Avenue, Hollywood, where things start taking off. Besides playing over a lot of changes, Richard starts doing a weekly performance at the Musician’s Institute P-100 concert room with various musician’s at first, but later notably with Jan Fabricky on drums and J.Kleutgens on bass, with their band ‘Plus Tax’.Their goal is to write strong material, while still staying true to their guitar roots and leaving a lot of room for improvisation. 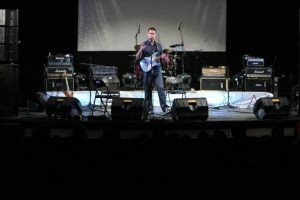 With their music ranging from rock, fusion, jazz to pop and heavy riffs they gain quite a following at their weekly perfomances at the school and also throughout L.A. They continue to perform all year and end up recording their first album in the M.I. studio, (now known as ‘Tommy Tedesco’ studios where numerous artists have recorded CD’s since the first recordings of Richard and ‘Plus Tax’) which was an initiative from engineer and eight finger tapping guitar wonder TJ Helmerich. Some players who stop by to jam at those recording dates are Scott Henderson, M.I. teacher Dan Gilbert, Carl Verheyen and Frank Gambale. At the end of ’94, Richard gets a phonecall from guitar guru Mark Varney well know for his monthly ‘Spotlight Column’ in Guitar Player and his Legato Records label who had featured so many great players Richard was heavily into before moving to L.A. Mark had heard some rumors about two hot new players and was interested in hearing some music. In ’96 after returning back to Amsterdam, Holland, ‘True Colors’, from Richard’s rock group Maximum Brain Disfunktion is printed in a small quantity and sold at local gigs around Holland. Rich also starts gigging around with drummer René Engel, probably best known for his CD project ‘Jazz Sick’ with Mike Stern and Danny Gottlieb. In ’98 Richard tours Finland, Germany and Holland and a local band to support the ‘Generator’ cd. In march ’98 Rene Engel’s ‘Spheres of Samarkand’ is released with lots of guitar work from Richard. Featured on that CD are also:Jeroen de Rijk (Mezzoforte) and Nippy Noya (percussion). In 2002 Rene Engel’s ‘Nostalgia’ is released which further showcased the style of Richard. Richard starts writing for the Dutch music magazine ‘Music Maker’ as a reviewer, tests new gear and interviews all of his favorite guitarists, sometimes twice.Most of these interviews are printed on this website under the tab ‘interviews’.The beginning of 2000 brings a welcome distraction from the usual: Richard plays a 6 month tour in theatres, playing 6 nights a week, performing 145 gigs of Händel’s classical masterpiece ‘The Young Messiah’ throughout Holland, Germany and Belgium. Besides being a much in demand sideman, in 2003 Rich thinks it’s about time to do it his way, all the way. He initiates the Richard Hallebeek Project (later known as RHP) and gets help from some of his musical friends: Shawn Lane who spent a lot of time in Holland, in The Hague and whom Richard took lessons from, and Brett Garsed both contribute four solos. The band consists of a few of Richard’s new musical friends, young drummer Sebastiaan Cornelissen and Swedish keyboard virtuoso Lale Larson both contribute songs for the RHP and are heavily involved in the creative process, making it more of a band effort. Within a month after it’s release on the new guitar oriented U.K. Liquid Note Records label, RHP tops guitar9.com being the best selling and most popular fusion album and the album gets rave reviews through out the world. RHP maintains a steady seller to this day throughout the world. At the end of 2010, Richard headlined the ‘Meeting Of The Spirits’ festival in Leeuwarden, Holland together with Greg Howe and Carl Verheyen. Richard also plays on more releases from Liquid Note Records: the two collection albums Alchemists I and II both feature Richard with different musicians, the last cd with drummer extra ordinaire Marco Minnemann. In 2008, Richard plays an 8-month, mostly 5 evenings per week, tour in theatres of 180 shows of his favorite musical HAIR, with a 32-piece cast throughout Holland, Belgium and Germany. Between the HAIR story and the hippies, he writes and records ‘Go For It’ together with his favorite rhythm section consisting of Sebastiaan Cornelissen on drums and Frans Vollink on Bas. Trumpet legend Randy Brecker joins them on the album. Richard has joined Lalle Larsson on his impressive Weaveworld trilogy: ‘Weaveworld’ (2010), ‘Infinity Of Worlds’ (2010) and Nightscapes (2012). Live, Richard has recently played the bigger guitar festivals in Europe; he played the Ziua Chitarelor guitar festival in Boekarest in 2009 with Mattias Eklundh and Guthrie Govan. 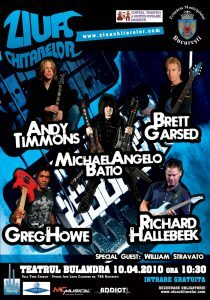 In 2010 he played the 2nd edition as well with Greg Howe, Brett Garsed, Michael Angelo, Andy Timmons and William Stravato. At the end of 2010, Richard headlined the ‘Meeting Of The Spirits’ festival in Leeuwarden, Holland together with Greg Howe and Carl Verheyen. and Kiko Loureiro. The three teach for 4 days and end up onstage together more then once. In 2011 Richard starts his own label *Richie Rich Music* to be able to release his own music in the future. one-voice was the first release on january 5th, 2013 and featured some of the guitarists Richard has shared the stage with over the past years: Greg Howe, Guthrie Govan, Andy Timmons, Alex Machacek, Kiko Loureiro, Jose de Castro, Randy Brecker and Eric Gale, all join Richard on this fusion-fest that also features Lalle Larsson on keys, Sebastiaan Cornelissen (dr) and Frans Vollink (b). The next two releases for 2013 on Richie Rich Music were the re-release of the classic 1995 release ‘Generator’ (with Scott Henderson, Carl Verheyen, Dan Gilbert, Scott Kinsey and Frank Gambalei), which was originally released by Mark Varney on his Legato label. The remastered version of the 2004 release ‘RHP’, including a bonus track was released may 2014. At the end of 2013, Richard was asked by Dweezil Zappa to share the stage with him at The Melkweg, Amsterdam, where they both jammed on ‘Zomby Woof’. In 2015 and 2018, Richard joined the stage again with Dweezil Zappa. There have been interviews and reviews with and about Richard in the ‘Guitarist’ and the Dutch ‘Music Maker’, American ‘Guitar World’ and ‘Jazz Times’ and the Japanese ‘Young Guitar’ and the Italian ‘Axe’ and the cover of Polish ‘Gitarzysta’. Richard Hallebeek has an endorsement with Suhr Guitars USA, HOOK amps and speaker cabinets, TC Electronics and Fractal AudioSystems FXII. Richard is currently writing for a trio album with bass, drums and guitars that is planned for late 2017 and is working on his 4th instructional dvd for TrueFire. 2014 – Q.E.D. – Peter Fernandes (with Gary Husband, Jimmy Johnson, Virgil Donati, Brett Garsed, Greg Howe, Ric Fierabracci, Derek Sherinian and many others) 2018 – Jeroen van Helsdingen Band – Hels! 2018 – Jeroen van Helsdingen Band – Hels!